Please provide us with the manufacturer, model and serial number of the pump, as well as the name or description of the parts that you require and we will provide you with an OEM parts quotation. 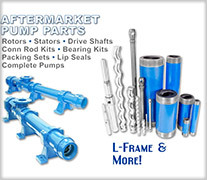 All pump parts, whether OEM or aftermarket, eventually wear out and require replacement for continued operability. An aftermarket progressive cavity pump part from Liberty can work just as well for your application as their more expensive OEM cousins. For process equipment and custom solutions for your biggest process challenges, please call us at 403-214-2049, email us or complete our forms.